The monocrystalline silicon solar may cost much despite the fact that it enjoys high photoelectric conversion efficiency. 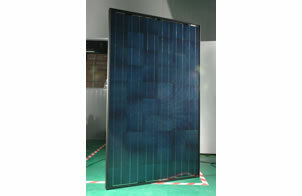 In order to save silicon materials, we have the polycrystalline solar panel replace the monocrystalline solar panel. Strictly in accordance with quality improvement and data control system in the production process, our polycrystalline solar cells feature stable and reliable quality and performance. As a professional manufacturer of photovoltaic solar panel in China, Eoplly can also provide many other solar products for you, such as monocrystalline and polycrystalline solar modules, solar lighting projects, building integrated photovoltaic systems, on grid and off grid solar power systems, portable solar chargers, and solar tracking systems. So far our products have received many certificates like IEC, TUV, CE, UL, MCS of the United Kingdom, ISO9001:2000, KSC of South Korea, and many other relevant authoritative certificates of Europe, America, and Asia. With high performance and competitive price, our products have been exported to North America, Europe, Oceania, Eastern Europe, East Asia, etc. If you need monocrystalline solar cell, please contact us freely.